How much will a night at a hotel or vacation apartment cost you? That depends a lot on whether you’re in a place like Boston or a place like Billings. The lodging price differences can be immense even within a country, though there are a few twists depending on where you are in the world. It’s easy to compare apples to apples for lodging price differences in the USA because the market is so dominated by chain hotels. Most of these brands don’t vary much from place to place—that’s part of their appeal. Sure, there are differences around the margins, but it’s hard to tell when you wake up in a Hilton or Courtyard by Marriott whether you’re in Albany or Anaheim. Same size room, same amenities, same furniture even. The differences can be pretty shocking. A Homewood Suites or Best Western Plus standard room in Syracuse, NY is around $100 mid-week in May, less on the weekends. In New York City it’s $210-$360 for the same kind of room on the same date. (And it’ll probably be much smaller.) A Hampton Inn room that’s $148 in Omaha is $405 in San Francisco. Go play with Trivago a bit and you can play the same game for Sarasota vs. Miami, Spokane vs. Seattle, or any place in Illinois vs. Chicago. Around the world, how much difference does it make when staying in a big city compared to a much smaller one? In general, the same trend applies, even if there are more independent hotels or lodges. Just look at the big differences in Italy or France to see what I mean. Even in some developing countries, there’s a big underlying cost difference because of real estate prices, taxes, and labor costs. The cheaper the destination though, the smaller the gap tends to be. Just keep in mind that tourism numbers can throw things off. Beach resort areas defy the rule, as do places that are major attractions, such as Machu Picchu town, Petra, Hoi An, Kyoto, or Venice. Basically any place being tagged with an overtourism crown is going to cost you. How do lodging prices stack up in the very cheapest places to travel? Hotel prices in the capital cities of Latin America are often a bargain, for instance. Two can get a fairly nice hotel room for $40 or less. How much does the gap narrow when the whole country is a lodging bargain? I looked up the same random weekday in May on hostel sites, hotel booking sites like Booking.com and Agoda, then Airbnb. Here’s what I found. To keep it simple, this is for two people, so the hostel prices are for two bunk beds with shared bath (single person price X 2). How well does this correlation hold up when we look at five or six other places? Much better in expensive countries than in most cheap ones it turns out. As you can see above, it’s cheaper in the smaller cities, but the difference is usually not as dramatic as you’ll find in North America, Western Europe, or Japan. Then there’s the competition aspect. Prices in Buenos Aires are as good or better than what you’ll pay in Salta or Mendoza. The same is true of Quito or Budapest. Backpackers in Penang won’t pay much more when they head to Kuala Lumpur. The reason for this is that there’s much more of a tourism infrastructure in the capital and therefore much more competition. If you own the only hostel in some small town, you have a lot more pricing power. When you’re competing with 30 others within a 10 minute walk, you are subject to market forces. It’s the same with apartment rental markets as well, which tend to flatten out as more inventory comes online. So in general, if you’re in an expensive country, you should limit your time in the main city to seeing what you want to see and getting business done. Then hop the train/bus out of London, Paris, or Sydney. You’ll get a whole lot more for your money in the smaller towns and cities. In many of The World’s Cheapest Destinations, however, it doesn’t make all that much difference unless it’s an out-of-whack place like Mumbai or Manila—places you probably don’t need to spend much time in anyway. Stay in Bangkok for the food and nightlife if you want because it’s actually one of the best lodging values in the world for a big city. Soak up the scene in Sofia or Bucharest for a week if you feel like it because they’re pretty darn cheap. This is another budget advantage to picking the right destinations: you don’t have to hightail it out of the big city because accommodation is too expensive. So you only leave fast when it’s a pit like Jakarta or Guatemala City and there’s no good reason to stick around anyway. The lodging price differences exist in less expensive countries, but they’re not as large by dollar value or percentage. Like this post? 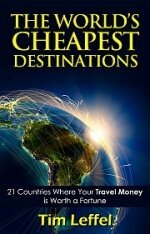 Get on our digest list and see regular updates from the Cheapest Destinations Blog.